Home » Video Marketing » How To Get More Affiliate Sales From YouTube Videos? YouTube is the largest video platform that provides excellent opportunities to advertisers, brands, businesses, and creators. 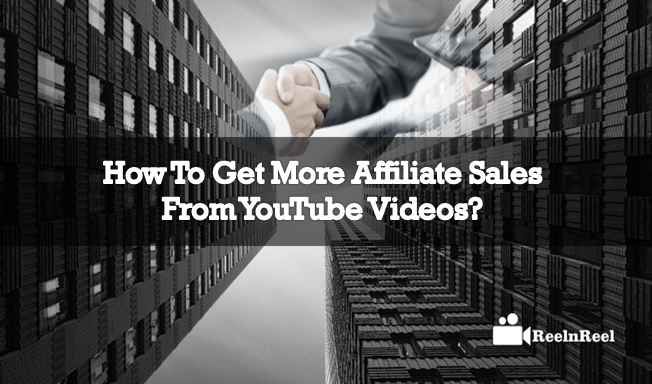 There are many ways to earn revenue from the YouTube platform, and one of the most popular ways is affiliate linking. Affiliate linking works well to boost the affiliate sales if you have a good standing channel with subscriber rate. Everyone knows that once can earn better revenue from the video views obtained from your YouTube channel. However, very fewer cents can earn from the video views. There is the best way to earn the income from YouTube through affiliate marketing. In affiliate marketing, you can recommend the products through your videos, and when the people click on to the links and make a purchase from the concerned merchant, then you will get good commission rates from every sale generation. There are various programs where you can participate in the affiliate programs and earn by promoting their products on your videos. How to boost affiliate sales? If your channel is eligible for making the affiliate revenue through affiliate marketing, then you need to get started by choosing the right affiliate product for promotion. You need to follow various steps to get started. You need to plan when you decide to start affiliate marketing on your YouTube channel. You need to know how far you can promote and what type of products you can match up with your videos to boost the affiliate sales. These things are significant to decide whether you are a right fit to start this marketing. You can add both the clickable and clickable affiliate links on your videos to start the affiliate marketing. Most of the times, viewers do not watch the complete video. Hence it is imperative to grab the attention of viewers. The non-clickable links have meagre conversion rate, and hence it is not hugely recommended over the clickable links. You can use the affiliate links software to shorten the links as some affiliate links that came from your marketers might be very long, and it will not be fine to keep those links like that on your video. Such a long links can’t held in your video description. So, you need to shorten those affiliate links to make it straightforward and easy for you and your viewers. To boost your affiliate sales, you need a good standing website for embedding the video content. It helps when a particular business or company are not willing to register directly by using the YouTube channel. For example, Amazon affiliate program does not allow you to register directly from YouTube channel. You need your website which must be a relevant one to the products you are going to promote. You can create the affiliate links for products to support them. The company which offers you the affiliate marketing will check your website eligibility. You can also promote the products directly with the product link, but you cannot earn the revenue. So, make sure you have created the affiliate links to boost your revenue. Create valuable and high-quality content to increase the sales. Use the links if and only if they are the right fit for your content. Go honestly in affiliate marketing by sharing your affiliate link related information in your video instead of only throwing it in your video description. Tag them to your social sites or channels. Don’t post the links to other YouTube channels. Remember that you need at least 500 subscribers to post links. Finally, follow these above tips and boost your affiliate sales with affiliate marketing on Youtube.